The 5ft & 6ft Leah are both Dual Beds, with 2 Adjustable Mechanisms and 2 Mattresses, for independent movement. The Leah Electric Adjustable Bed is also available in Extra Long Length for the Taller Person.Click here for more information. The Leah Wooden Electric Adjustable Bed is a traditional French Sleigh Style Bed crafted in Solid Natural Oak,coated with a clear stain. The gentle curve on the beds display true craftsmanship. Headboard Height : 1300mm(51.18 inches). Footboard Height : 770mm(30.31 inches). 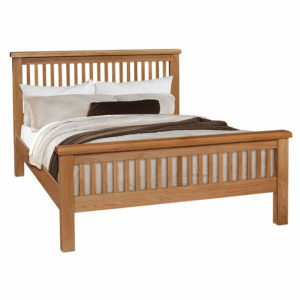 The Leah Wooden Electric Adjustable Bed comes with a 5 year guarantee on the bed base. The Leah Electric Adjustable Bed is suitable for High-Low/Vertical Lift/Carer’s Bed Mechanism, which makes it far easier for Carer’s to get easy access to their clients. 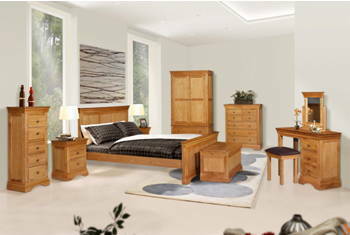 Complete range of bedroom furniture available to match this bed. Extra Bed Length available : 2.10 Metres(6ft 11″) & 2.20 Metres(7ft 3″).Our standard adjustable bed height is approx 22 to 23 inches from the floor to the top of the mattress (like most beds). We can alter your the height of the bed to suit your needs. This bed has a 7 inch gap between the floor and the base, which is ideal when using a bed table or a hoist. 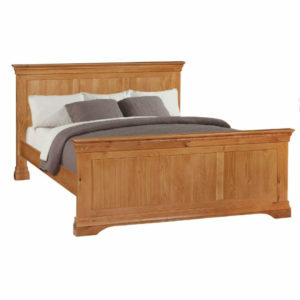 The picture shown is of a Double Bed(4ft 6inches). A Double Bed has One mattress. A Dual Bed(Size 5ft & 6ft) has Two separate mattresses (for independent movement).